I love the smell of chromatographic compression in the morning. It smells like…efficiency. Ok, so that was probably too many puns in quick succession. I’ll blame Jack for that influence. 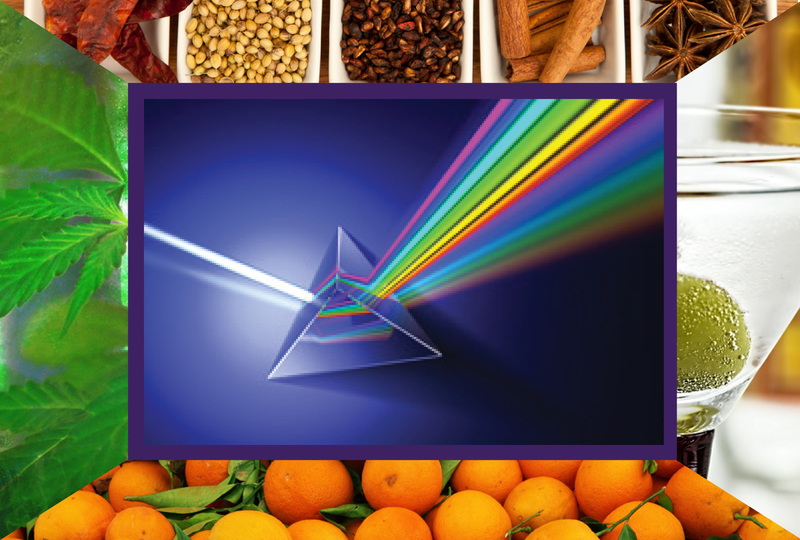 In Part 1 of Better Living Through (Flavor) Chemistry, we’ll take a first look at terpene isomer differentiation by GC-VUV, specifically how and why we’re able to utilize chromatographic compression so readily to speed up run times and increase sample throughput. 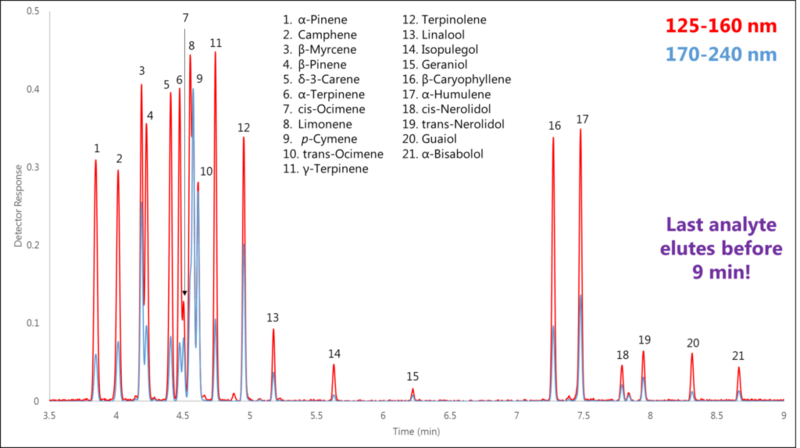 So why are we interested in terpene isomer analysis? Most products that we smell and taste contain terpenes: essential oils, perfumes, fruits and vegetables, spices and herbs, alcoholic beverages, cannabis, even some of our pharmaceuticals have naturally occurring or added terpenes that create their distinct and appealing odor and flavor profiles. What’s most astonishing about these compounds that contribute to such a wide swath of odors and flavors is that they are all built from units of the same molecule, isoprene (C5H8). This phenomenon leads to a high prevalence of structural isomers. 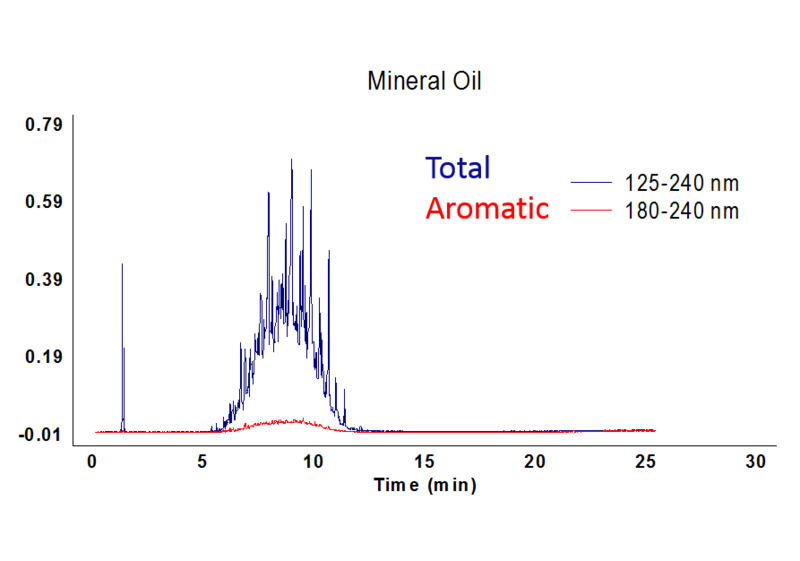 Traditional detection methods such as mass spectrometry can struggle distinguishing isomers, which necessitates good chromatographic separation to accurately identify and quantitate terpenes (Figure 1). However, because VUV spectroscopy can account for the entire 3-dimensional electronic structure of the molecule, the absorbance spectra of structural isomers can be distinguished visually (Figure 2). Utilizing these unique absorbance spectra, along with the fact that our detector technology is at ambient pressure and thus not flow limited, allows us to deliberately compress our chromatography by increasing the GC column flow and oven temperature program rate. 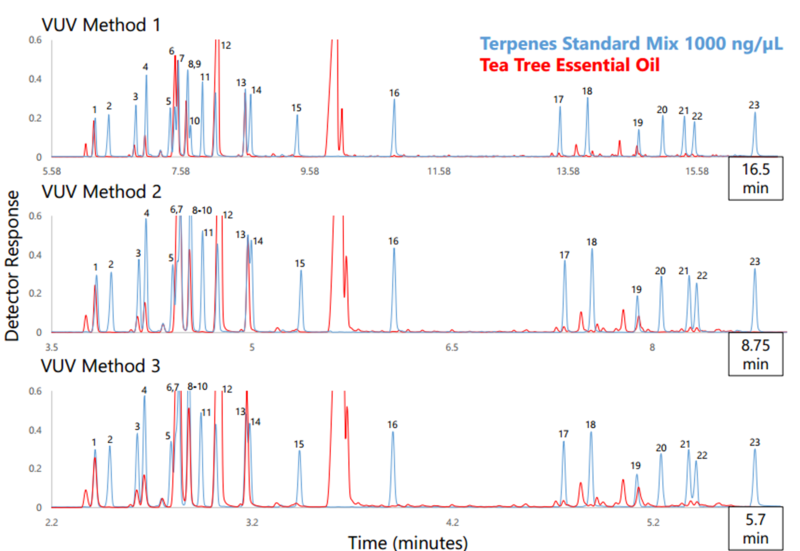 We ran a terpenes standard mix in which 21 mono- and sesquiterpenes eluted in less than 9 minutes (Figure 3)! In Part 2 of this series we’ll take a closer look at a couple of these coelutions to see just how we’re able to separate isomers using VUV spectral data. Stay tuned!